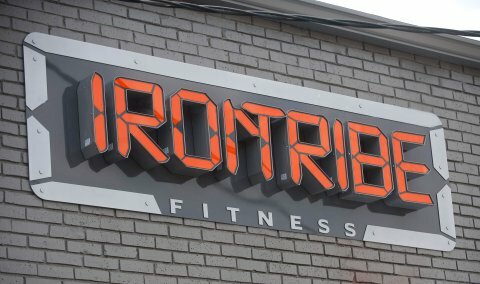 After 4 weeks and 3 classes per week, I repeated the initial Iron Tribe workout. My original time was 10:38. After a month I improved to 8:19. 2 minutes, 19 seconds fitter. I wanted to improve my time into the 8-minute range. I did that! I wanted to shave 2 minutes off. I did that! I wasn't really expecting that last one, but it happened. I've had 1 workout since graduating from the beginner class, and I couldn't finish everything in the time allotted. I'm ok with that. Part of me likes that, in that it shows how far I can expect to go. Plus, that first workout involved 800m of total running, where I've had only managed half that in a class so far. Just to keep it challenging, my advanced years are catching up to me and I've developed a case of either tendinitis or arthritis in my right wrist - I think the details of which are dependent on how much I was wincing at any given time when the chiropractor was twisting my hand. This just means I've gone to Amazon and stocked up on any type of brace that'll fit my wrist. I don't know what the next goal is supposed to be, other than keep going and keep feeling better (wrist notwithstanding). Thanks to Joe at work, there's a good chance I might die in the next month. 2 months ago Joe started going to Irontribe. Joe had never lifted a weight before (according to Joe). What little I knew about Irontribe was that it was a form of crossfit, which to be honest was not something I'd ever thought about, much less thought that someone like Joe would not only stick with for 2 months, but also enjoy. Nothing against Joe. I just know we both spend the majority of our week sitting in front of computers. 2 weeks ago Irontribe hosted a session one Saturday morning to come out for an (easy) practice workout to see if it would be a good fit. As an added incentive, if you're referred by someone (re: Joe) then you can take the 4-week Tribe 101 class for free. I enjoyed the practice workout, and it only took me 5 days to recover. For free, there's no reason to not try the 101 class and learn the moves that they speed through during the regular class. The 101 classes I'm in are Mon/Wed/Thu at 7pm. I've gotten through the first week, and I've enjoyed each workout. I've yet to not be sore afterwards (or even during, sometimes). It's the only real exercise beyond walking that I've done in years. 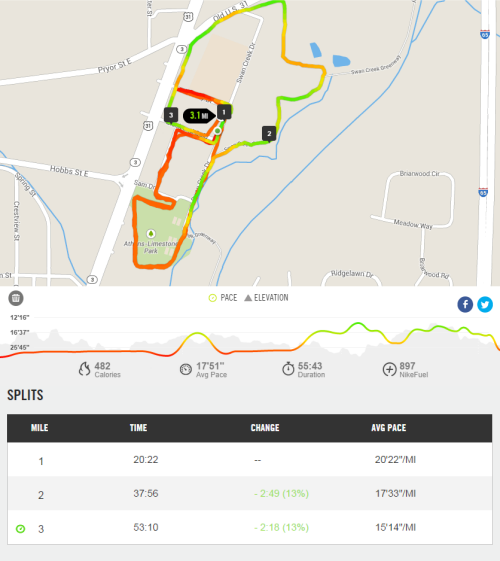 I'd been slacking off on my walking schedule and realized I need something different - were someone else sets the time and tells me what to do vs walking around a track at a pace I just kind of fall into. I've had a lot of huffing and puffing. I can actually trot - not quite a jog, but faster than the walking pace I had going around the school track. Granted, that trot is 100 meters at a time vs a 3 mile walk, but string a couple of those together while throwing in some excercises that invariably make my thighs burn, and I think I'm getting a better workout. The first night we ran a 15 minute capped exercise routine. 100 meter run (well, trot), 3 sets of body weight squats, 25lb kettle bell swings, and sit-ups (set 1 = 15 reps, set 2 = 12 reps, set 3 = 9 reps), finished up with another 100 meter trot (mostly a walk at that point). I managed a 10:38 time. At the end of 4 weeks that time is supposed to go down. I wonder if I can get it down to 8 minutes? My normal walking schedule is Monday, Wednesday, and Friday while trying to manage a 5 mile route each day. Not bad for someone who needed to rest when walking across a parking lot 2 years ago. This past week I faltered on Friday as I thought I would get rained out - the local radar always showed rain nearby but it always dissipated by the time it got here. To make up for missing Friday, I went on an evening walk Saturday. I met Gina over by the school and she took her first walk with me in a couple of months (due to her plantar fasciitis messing everything up). She made it a mile before the pains started shooting, but I'm proud that she made it that far. I stayed and walked a little farther. I've noticed that normally when I walk in the mornings, 5 miles of walking over an hour and a half feels about right. Later in the day, I don't want to walk as far but my pace seems to naturally quicken. When nobody else is within sight, I've even taken to attempting what I like to call a jog. Anyone else would call it a mildly controlled seizure where I somehow remain upright. Saturday night, since the walking track was devoid of anyone else, I decided to up my random jogging spurts. Normally on the last mile of my walk, when I'm in my zone and nobody is looking (see above), every ¼ mile (there are posts along the trail marking this) I'll jog a little until I run out of wind. This normally takes about 30 yards, although I would swear it's really about a ¼ mile. I'll then try to catch my breath before the next ¼ mile post and start the process over again. Saturday I decided to just see how many of my jogging spurts I could get in on a 1.5 mile lap. My lighting fast jogs register as green on the map above, save for the first one at the bottom around Athens-Limestone park. There are 6 green-shaded areas where I broke the sound barrier with my lighting fast pace. Lighting moves at a 13 minute/mile pace, FYI. Most importantly, I didn't pass out, fall down, or die from this extra exertion. Due to the tightness in my thighs I knew that walking around today would be.... fun, I'll go with fun. The grunts each time I get up and start to move are signs of fun. I'm just happy to be able to move and run around a little. I would walk 400 my-uhls - is that a song? It's been a little while since I mentioned anything about my walking regimen, but I'm still going at it. I've switched from 5 times per week to 3 times per week, but upped my distance per walk from 3.7 miles to 4.5-5. I've also slowed my pace a little, due in part to not walking as much with Gina (as she tries to get over a bout of plantar fasciitis) but a slower pace is also easier on my knees. I tell myself the longer distance helps to make up for it. I've also started walking in the morning instead of the evening. Starting a walk at 6AM helps to beat the traffic, plus just moving around during the course of the day seems to help keep me from feeling as stiff as when I walk and go to bed soon thereafter. I'm not sure how much of this is in my head and how much really makes a difference, but I still feel better every day. Ah, the end of April. What has this month brought? The last 2 days have been fraught with tornado warnings, watchings, and whatever else should be associated with spinning, twisting destruction. Luckily, I was unaffected by this bout of weather. I never even lost power - I had that flashlight by the bed for no reason. I had plenty of text messages and phone calls to check on me and warn me to be weather aware, so it's nice to know people out there are helping to take care of me. I'm still slowly working my way through painting my miniatures for Dust Tactics/Warfare. 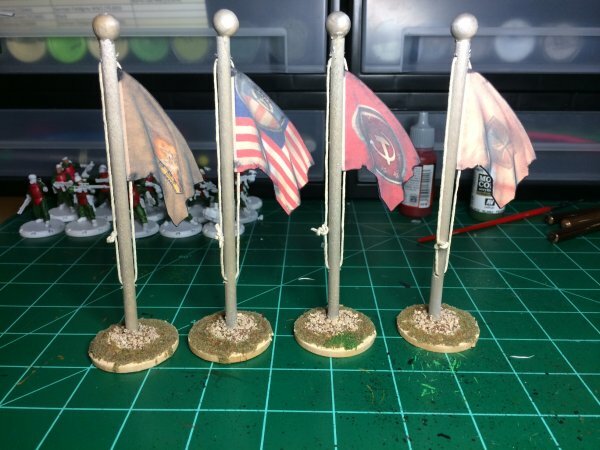 I went a little crazy and put together some flags to use as objective markers/scenery, all from scratch! I've been wanting to make some flags for a while. I lack the skills to properly make them out of modelling clay/putty (I tried, it did not go well). Instead I used my mad skillz with manipulating 3D files and textures and whipped up my own flags and printed them out. Thanks to using a 3D program that could render the flag as if being blown by a light breeze, the printed flags have a little bit of a 3D look to them - actually more than I thought they would. The flag poles are small wooden dowels from Hobby Lobby that I cut to a length that seemed to work. Yes, that is meticulous measuring on my part. They're topped off by little wooden balls that were hanging near the dowels in the store. I have no idea what they would normally be used for, but they work. Top it all of with some chrome spray paint that somehow manages not to be all shiny and sparkly, which is good in my case, and I end up with a teeny-intsy flagpole. I've been trying to figure out a good way to attach the flags to the poles for weeks. Gluing the flag to the pole would be easiest, but I wanted something that would look a little nicer. While wandering through Hobby Lobby I came across Hemp String in the Beading/Jewelry section (I will wander all over that store). It looked the right thickness that would work as rope for the scale of the minis, so I picked some up. While playing around, I decided to try drilling some holes in the wooden dowels with my "precision modelling drill" (screwdriver with a drill bit). The hole was big enough for the Hemp String to go through, so I had the bright idea of gluing the flag to the string and looping the string all the way through the flagpole. The bonus result - I can raise and lower the flags! Although there's no picture to prove it, I've managed to drop another 5 lbs since the beginning of the month and weighed in at 306 lbs this morning. 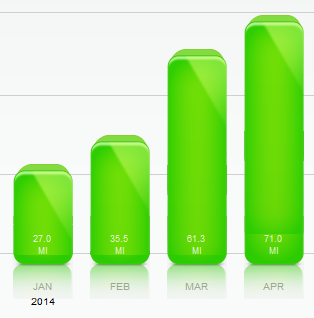 Right when I thought 61 miles in March was a long way to go, this month we got in 71 miles of walking. 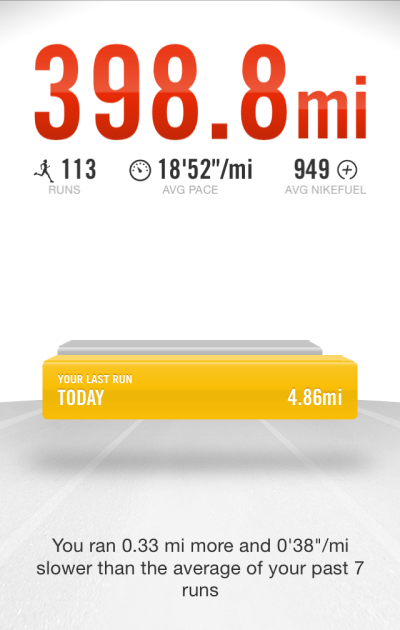 I remember when the pedometer app on the phone rolled over 100 miles total in early March. We've more than doubled that in less than half the time. Now that we're walking ~5 days/week our monthly average should be right around 70 miles. In a month. That just boggles my mind. I have a post-walk routine now. After we walk, I take a much needed shower, then lay on the bed with ice packs on my knees for at least 45 minutes while I watch tv or read. The ice helps (mainly on the following day) - I'm not sure if I'm walking harder or if the bone spurs that showed on knee x-rays back 20 years ago are starting to make their presence more pronounced now that I'm not just sitting around all of the time. Either way, the ice appears to take care of most of it, so I'm going to keep doing it. That's all that's on my mind for now. I think I'll go ice my knees while painting flag poles and watching out for tornadoes.